Anchor text is the text associated with a text link and Google considers anchor text as a very important SEO ranking factor in 2018 for both the webpage the link goes to AND the webpage the link is on. 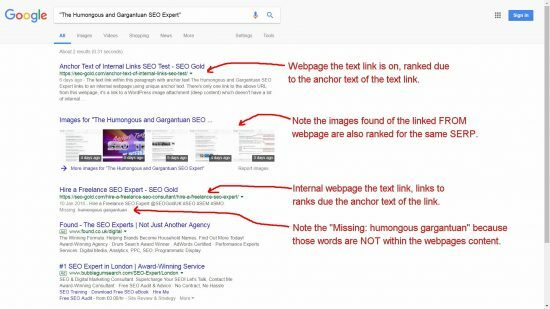 Yes, the anchor text is a ranking factor for the linked to and the linked from webpages, so be aware of what you use as anchor text for all your links, it’s important. There’s an SEO myth only external links (links to webpages outside the domain) pass SEO benefit through anchor text, whilst the SEO fact is both internal and external links pass anchor text benefit. I guess the SEO myth started because some webmasters don’t understand that to Google all links pass SEO value. Internal links are links to webpages under the same domain https://seo-gold.com/. 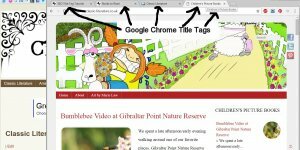 External links are links to other webpages on other domains like links to https://md-law.classic-literature.co.uk/ (a sub-domain that’s part of another domain I own). 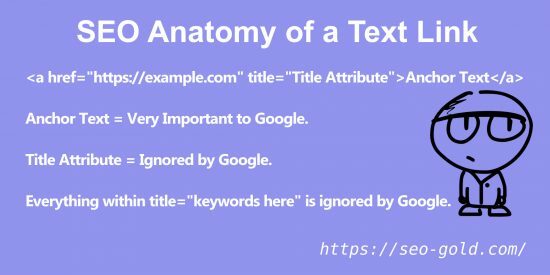 This is a really easy SEO myth to disapprove with simple anchor text SEO tests. 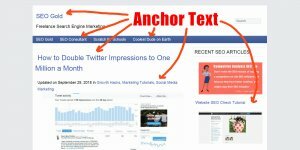 How to Setup an Anchor Text SEO Test? All we need is a webpage like this one and with the simple addition of a couple of text links (one to an internal webpage and another to an external webpage) we can show the anchor text passes SEO benefit to both of them. Really easy SEO test to setup and check, try it yourself. 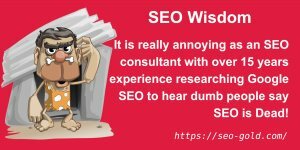 The text link within this paragraph with anchor text The Humongous and Gargantuan SEO Expert links to an internal webpage using unique anchor text. There’s only one link to the above URL from this webpage, it’s a link to a WordPress image attachment (deep content) which doesn’t have a lot of internal links (the text link above is just the second internal link: it took 6 days for Google pass the anchor text benefit through the test link above). 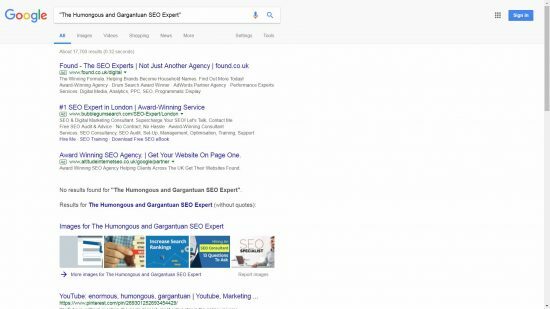 The linked to internal webpage DOES include the phrase “SEO Expert”, but does NOT include the words “Humongous” or “Gargantuan” and has never been linked to with those words as anchor text, so if Google ranks the above webpage for any SERPs including those two words it’s because of the link above’s anchor text. I performed an exact match (added “speech marks” around the text) Google search for the above links anchor text BEFORE publishing this SEO test. At the time (January 31st 2018) there were NO exact match results for the obscure phrase: see screenshot. The screenshot above is the BEFORE results, the screenshot below is the AFTER results (after Google indexes the link above). The SEO test results are clear, as expected this webpage AND the linked to internal webpage is ranked for the obscure Google search phrase above, screenshot below. You will note only two webpages are found for this Google search and the linked to result includes a “Missing:” notice because those words are NOT present within that webpages content. The text link from this webpage is passing anchor text SEO benefit through the link for those two words to another internal webpage. I’ve avoided using the two words which mean big anywhere else on this webpage, only used them in two text links to reduce variables to monitor: keep SEO tests simple. You will also note many of the images from this webpage are also listed for this SERP, Google is considering all those images relevant to that search because of the one text links anchor text. The above SEO testis for an internal link, let’s also test an external link (a link to another domain). The text link within this paragraph with anchor text The Humongous and Gargantuan Donald Trump Poem links to an external webpage using unique anchor text. 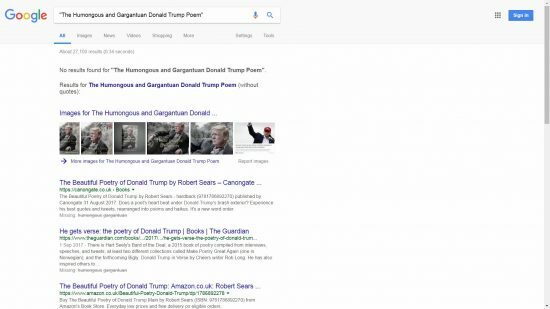 The linked to external webpage DOES include the phrase “Donald Trump Poem”, but does NOT include the words “Humongous” or “Gargantuan”, so if Google ranks the above webpage for any SERPs including those words it’s because of the link above’s anchor text. The SEO test results are clear, as expected this webpage AND the linked to external webpage is ranked for the obscure Google search phrase above, screenshot below. 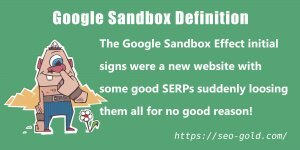 You will note only two pages are found for this Google search and the linked to result includes a “Missing:” notice because those words are NOT present within that webpages content. The text link from this webpage is passing anchor text SEO benefit through the link for those two words. I’ve avoided using the two words which mean big anywhere else on this webpage, only used them in two text links to reduce variables to monitor: with SEO tests, them them simple. Interestingly the Google search lists an image from the linked to webpage, so the anchor text SEO benefit appears to pass through the text link to the image as well: in 15+ years as an SEO consultant I’d never thought to test this, great to learn something new. What’s also interesting is the image shown isn’t actually loaded on the linked to webpage. If you are a WordPress user you will know when you upload an image WordPress creates multiple different size versions (the SEO theme I use creates over a dozen sizes). On the linked to webpage it shows the 640px by 788px version to visitors (that’s also the largest size which loads when viewing with a device view port above 800px), but Google is listing the full size image (1000px by 1232px). The full size image isn’t loaded on the webpage, WordPress does reference all image size versions including the full size image in the code: it’s for responsive images for different size device view ports (mobile phones etc…). Google image search has preferentially listed the full size image which is only view-able by a visitor by visiting the WordPress attachment page and clicking the image (two clicks away from the linked to webpage). 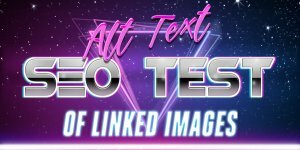 Also see my linked Images Alt Text SEO Tests which are the tests above, but the anchor text is replaced by an image with alt text. Why Setup an Internal and an External SEO Anchor Text Test? Some webmasters (even SEO experts) don’t believe internal links pass anchor text benefit, but they do believe external links pass SEO value. 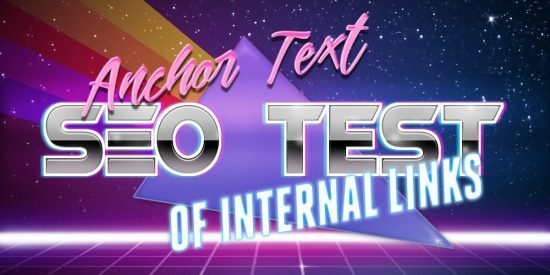 By having an external link anchor text SEO test in the exact same format as the internal link test we set a baseline (a control) to compare the SEO results. 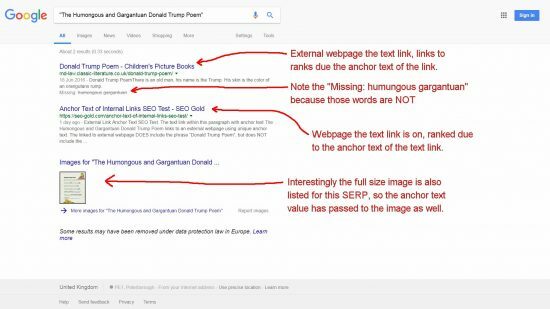 If Google treats internal and external links equally with regard anchor text benefit the two exact match obscure searches should have similar results (and they do). We should see this webpage ranked for both obscure exact match phrases: the text of the unique phrases are on this webpage, so Google should rank this webpage for both of them: the results above show Google does rank this page for both SERPs. We should also find the linked to webpages are also ranked for the obscure phrases: the results above show Google does rank those two page for the respective SERPs. By removing variables during SEO testing it makes the analyses of the results so mush easier. For example if the anchor text was for actual real SERPs with traffic, not the obscure phrases no one will ever search for. We’d be competing against webpages which are targeting those phrases. 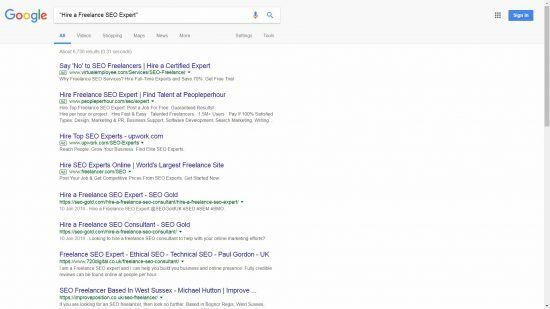 If the internal anchor text SEO test was a link with anchor text “Hire a Freelance SEO Expert” there’s already over 6,700 webpages indexed for the exact match Google search: screenshot below. As you can see from the screenshot above, not only are there 6,700 exact match results for “Hire a Freelance SEO Expert”, but there’s also four Google AdWords ads before the organic search results (businesses are willing to pay for the traffic) and the first two organic results are already for this domain BEFORE adding an SEO test link. 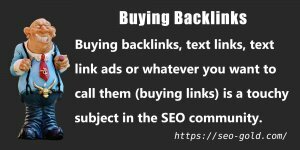 It’s almost impossible to test SEO ranking factors like anchor text with real money SERPs, you have to use obscure phrases so it’s clear WHY you see what you see. There’s no ambiguity in my two anchor text SEO tests, the results are clear because the test is simple and limits the number of variables. Like all the SEO tests on this website they are public SEO tests which can be damaged by a simple mistake like a commenter using the obscure phrases in a comment. I also have multiple private versions of all my SEO tests on other domains which are less likely to be damaged: I have so many private SEO tests I’ve lost count. If I say something like the title attribute (hover-over tooltip with format title=”Some Text Here”) of text links has ZERO Google SEO value, it’s because I have multiple SEO tests proving it has no SEO value (for example there’s a link with a tooltip with a unique phrase on this webpage): it’s as close to an SEO fact as you are going to get. If I say something like I think/believe Google treats anchor text as more important than linked alt text it means I haven’t been able to setup a conclusive SEO test, but it makes sense to me: it’s up to you if you believe me.